1 Preheat oven to 350°. Grease 13 x 9-in. baking dish; set aside. 2 Stir 2 Tbsp. Hellmann's® or Best Foods® Real Mayonnaise into large skillet over medium-high heat and cook vegetables, stirring occasionally, until tender, about 8 minutes. 3 Whisk eggs with milk in large bowl. Stir in remaining 2 Tbsp. Mayonnaise. Stir in 1-1/2 cups cheese, cooked vegetables, potatoes and bacon. Pour into prepared pan. 4 Cover with aluminum foil and bake 45 minutes. 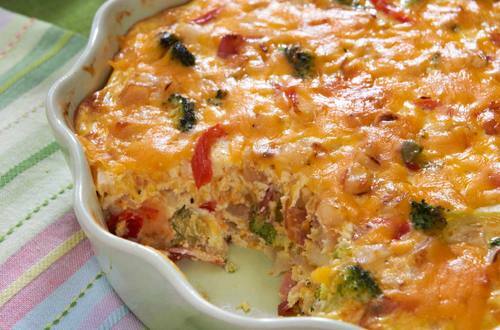 Uncover, then sprinkle with remaining 1/2 cup cheese and bake 35 minutes or until eggs are thoroughly cooked.